So I was going for Mad Men red hair, but as I sat in front of the mirror in the leather and essential oil themed salon sipping my cup of vanilla chai, I wasn’t absolutely convinced. “It’s going to totally be Joan when it dries,” said the optimistic hair stylist, holding up strands of purest orange to the mirror light. “Are you sure it’s not, well, a bit pumpkin?” I wondered. “No way.” He shook his head, causing the dreadlocked part of his Mohican to jiggle in a clatter of plastic beads. “Nah ah. If that were a pumpkin it would be some totally hot one,” he said. Thankfully, after the application of a second round of dye, the hair turned out fine, nevertheless, in honor of impending Halloween, I figured a totally hot pumpkin soup would be the perfect Monday treat. This entry was posted in The Monday Treat and tagged mad men, pumpkin, recipe, soup, Thanksgiving, vegetarian. Bookmark the permalink. Thanks for participating in our RecipeLion Blog hop! Just letting you know we’ll be featuring your recipe with link in one of our upcoming newsletters. Hope you can join us again for next month’s blog hop on the 18th. Thanks! 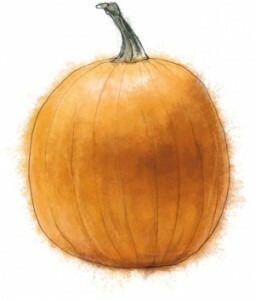 is there a way to substitute the cubed pumpkin with canned pumpkin? I’ve never tried it, but I should think it would be ok. It would have to be plain pumpkin though, not flavored or sweetened pie filling … but you may have stumbled upon a brilliant short cut! Let us know how it works out if you try it. I might have to try it myself this weekend.